Palestinian President Mahmoud Abbas has denounced Israel’s occupation of the Palestinian territories, as he assumes the chairmanship of the largest bloc of countries at the United Nations. 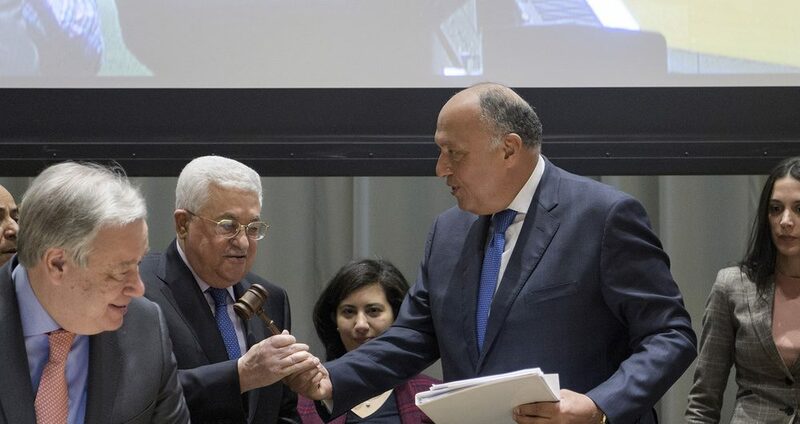 Abbas made the remarks at a ceremony marking the handover of the chair of the Group of 77 (G77) from Egypt to Palestine at the UN headquarters on Tuesday. “I am pleased to take over today the chairmanship of the Group of 77 on behalf of the Palestinian people and the State of Palestine,” he said. “It is a great responsibility that the State of Palestine will bear with complete humility. The Group of 77, a coalition of 134 mainly developing countries and China, was founded in 1964. It initially had 77 members, but currently represents some 80 percent of the world’s population. At his Tuesday’s speech, Abbas blasted Israel for hampering the development in the Middle East through its occupation policy. The Palestinian president further condemned the scourge of terrorism “in all its forms, colors, and types” regardless of who perpetrates it. “Terrorism takes place worldwide on a daily basis. It is an epidemic and I therefore call on all countries of the world to cooperate, to put an end to terrorism, to uproot it,” he added. Palestinian officials hailed Palestine’s G77 chairmanship as a step towards the country’s full UN membership. Foreign Minister Riyad al-Maliki announced that Palestine is consulting with the UN Security Council member states about its membership bid despite the US threat to veto the measure. “The moment we conclude the process, we will present the application,” he told US television network CBS. Since then, the Palestinians have joined dozens of international organizations and agreements as part of a campaign to garner support for the recognition of their homeland as a sovereign state. Last October, the General Assembly voted to temporarily elevate Palestine’ status at the UN so that it could take over the rotating chairmanship of the G77 for 2019.